Despite being famously diverse animals in almost every other ways, one of the defining features of a cat is its tendency to feed in a very similar way to all other cats. The feline diet is a relatively narrow church – they all eat the same kinds of things, in the same kinds of ways. This article hopes to be a quick run down of what those things are, and the methods they use to secure and consume them. Cats cannot survive without meat with the single exception of the snow leopard cats (sometimes this cat feeds on vegetation and grass). For a cat to be fed, its meal must be of an animal – though any animal will do. Dietary preferences vary between species, but all cats will eat almost any meat if offered to them – it’s rare that a cat’s diet is so specialised that they cannot survive without a specific type of meat. The most prominent example of the exception to this rule is the Iberian lynx, a near-extinct species that is pretty much only able to thrive when they have access to a particular species of rabbit native to its European home. Sadly, newly-developed illnesses have wiped out much of the population of these rabbits – a fact that has left the rare lynx in dire straits. It’s impossible to remove a cat’s hunting instinct entirely. The most docile, friendly, incompetent elderly housecat in the world, a cat who has never been into a garden or met any creature smaller than it, will still crouch, stalk and pounce after cat toys, carelessly positioned human feet and invisible intruders no human can fathom. 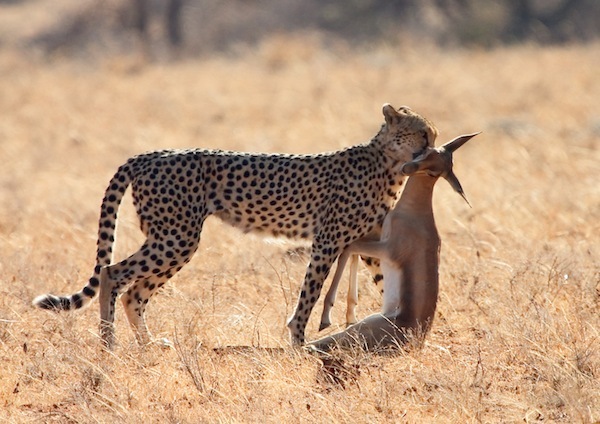 Hunting is a universal trait in the feline world. Methods vary: some cats, like the lion, prefer to hunt in groups and will surround their prey before tearing it apart with sheer strength and power. The cheetah lies in wait for its prey to come close, then captures it in one blurry-fast sprint. Jaguars kill their captured by sinking their teeth straight down into the brain, while most cats instead dispatch them with a swift bite to the throat. Clouded leopards stalk their food through dense undergrowth before pouncing, leaping or jumping and landing on the poor unfortunate from above. Some cats fish, while others prefer to concentrate only on land animals. Tactics and techniques change from species to species, but one thing remains the same: all cats are fierce hunters. While it’s true that hunting is a universal trait, that doesn’t mean that cats will turn down other food if it’s on offer. 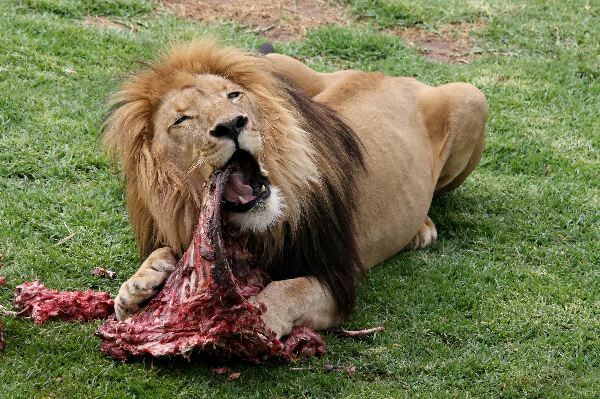 Even the most diet-specialised of felines will respond to finding carrion or another food source laid out for them, and a few species are expert thieves – lions quite often seize upon another’s prey, for example. If it’s there and it’s meat, a cat will eat it. Feral cats and some species like bobcats who have adapted to semi-urban environments will actively scavenge, too, finding food sources in bins and dumps when the local wildlife produces slim pickings. There’s some evidence that this tendency is detrimental to big cats kept in captivity. They need to hunt; it keeps them fit, healthy and sane. If they’re fed too often, though, they get lazy – why do all that chasing when there’s food right there for them? This can cause health problems in some species. Thankfully for both us and for our beloved companions, domesticated cats do not appear to be amongst those species – at least partly because many of them are so highly bred as to be remarkably incompetent hunters. Excepting certain health problems, all species of feline are good at surviving without water. Precisely how long for varies, and depends heavily on their diet – a domestic housecat fed exclusively on dry food will make it a little longer than a human’s three days but not by much, while certain species adapted for desert life who eat freshly-killed or even still-live prey can sometimes go for months without a drink. It’s not that cats don’t need water; it’s more that they need so little of it that generally speaking the water and humidity available in the blood and organs of their food is more than enough. Of course, surviving without liquid in this way isn’t ideal for any cat – it affects their health and performance just as you might expect. The fact remains, however, that they’ve evolved to be better able to cope with thirst than an awful lot of land mammals. This is an invaluable trait for an animal who has for large portions of its history lived mostly in arid climes, and is thought to be one of the reasons that felines tend to come out of droughts better off than many of their competitors.